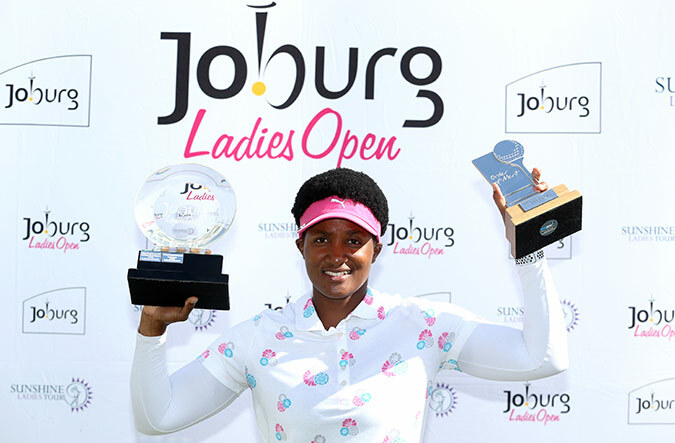 SOWETO, 28 March 2019 - Nobuhle Dlamini put an exclamation mark behind a dominant season with an emphatic four-shot victory in the R500 000 Joburg Ladies Open at Soweto Country Club on Thursday. Her fourth Sunshine Ladies Tour victory – and her second win this season after her Dimension Data Ladies Challenge success last month – confirmed Dlamini as the Investec Property Fund Order of Merit champion for the 2019 season and earned the 27-year-old a bonus worth R100 000. The big-hitting Swazi national carded a final round two-under 70 to triumph on a two-under 214 total. “It’s a massive victory for me,” said a delighted Dlamini. “I didn’t expect to win the Joburg Ladies Open, but I put in a lot of work for this season. “Coming into the final event, I knew I didn’t have to win at Soweto to win the Investec Property Fund Order of Merit, but I really wanted it After the first two rounds, I knew I could win. The order of merit title would be even sweeter if I picked up a win. Two wins this season and the order of merit. I am really proud of what I’ve achieved. Dlamini began the final round on even-par with a one-shot lead over SA Women’s Masters champion Lejan Lewthwaite and two shots clear of Sunshine Ladies Tour rookie Casandra Hall. She fired seven straight pars before dropping two shots at the par four eighth. Back-to-back birdies at nine and 10 took her back to level, and she erased another double bogey at the 11th with three birdies on the bounce from the par four 13th. Dlamini finished two shots ahead of former South African Women’s Open champion Tandi Mc Callum, whose final round 70 earned her a runner-up finish and bumped the Parkview golfer second in the season-long points race. Ebotse’s Hall finished solo third on six-over following a third round 76. The round of the day – and the tournament – belonged to Lora Assad. The Johannesburg golfer scorched her way around the Gary Player-designed championship layout in 67 strokes and rocketed to joint fourth on seven-over alongside Monique Smit from Southern Cape. Dlamini picked up her maiden pro win in the SuperSport Ladies Challenge, presented by Sun International at the Wild Coast just over a year ago and it proved a watershed moment for the Glendower professional. “This season has been the best of my life, but the Wild Coast was the pivotal moment. That’s when I knew for certain that I could compete against the best and beat them. It changed my mind-set and I’ve just become mentally stronger since. Playing in the heart of Soweto, made the double triumph even sweeter for the 27-year-old. “When they first told us that the Joburg Ladies Open would be hosted here I couldn’t believe it,” Dlamini said. “I played here three years ago and it was not looking good. The greens were not good and the fairways were bumpy. It was like coming to a whole different course when we played the pro-am here on Monday. I was so pleasantly surprised and impressed. “We owe a huge debt to Selwyn Nathan for championing the refurbishment of this course. The Sunshine Tour rallied the support of the City of Joburg, the PGA Tour and the European Tour, the R&A and sponsors like Investec, Dimension Data, Telkom, SuperSport and PPC Cement to create something incredibly special here. “I know a lot of golfers who live in Soweto and who had to travel by taxi to go and practice at the better courses in Johannesburg. One of them lives two minutes away from the course. He came to support me in the first round and cannot wait to start practicing here. GolfRSA Elite Squad member Zethu Myeki carded rounds of 80, 76 and 73 to claim the leading amateur honours on 13-over. The Ernie Els and Fancourt Foundation member tied for 13th with Lewthwaite, who finished third on the order of merit after closing with a final round 84. Kim Williams finished fourth and Hall fifth to make it an all-Southern-African sweep of the top-five in the Investec Property Fund Order of Merit. Nobuhle Dlamini fired three birdies on the bounce down the back nine of Soweto Country Club to line up a fourth Sunshine Ladies Tour victory in the Joburg Ladies Open on Wednesday. Dlamini began the second round tied for the lead with reigning SA Women’s Masters champion Lejan Lewthwaite, but she opened up a one-shot lead with a second successive level par 72. The Investec golfer is still nipping at her heels on one-over following a second round 73, while Sunshine Ladies Tour rookie Casandra Hall lies a further stroke adrift on two-over, courtesy of a brace of 73s. Former SA Women’s Open champion Tandi Mc Callum got into the mix at four-over with an even-par 72. India’s Tvesa Malik followed a one-over opening round with a 76 on day two to slip to a tie for fifth with 2019 SA Women’s Longest Drive champion Lenanda van der Watt, who returned a 74. Yolanda Duma fired a one-under-par 71 for the shared low round of the day. The Border golfer rocketed to joint seventh on six-under, and will have former Sunshine Ladies Tour winners Stacy Bregman and Monique Smit for company in the final round. Dlamini is justifiably in a confident frame of mind. She will be gunning for the double in Thursday’s final round – win the R500 000 Sunshine Ladies Tour season-finale and bank the R100 000 bonus for winning the season-long points race and it will take something special to stop her. "I’ve had two good days as I’ve played solidly from tee to green,” said the Investec Property Fund Order of Merit leader. Dlamini followed a birdie start with a trio of bogeys and went out in two-over. Coming home, the Glendower golfer birdied the 10th but a careless double-bogey on 11 got her into the right frame of mind. She fired three birdies in a row from the par four 13th to steady the ship and cemented herself at the top of the leaderboard with solid pars over the last three holes. “I dropped on two of the par threes on the front nine, which was annoying,” Dlamini said. “I made a good birdie on 10 over I overshot the green, but at the next hole I pitched it too close to the pin and it flew off the back. I chipped it short of the green two-putted for a double. I hit a great drive, so to drop two shots after being 78 metres from the hole hurt. But I’m proud of the way I came back after that. Aside from her obvious title ambitions, Dlamini was pleased to be playing an important golf event in the heart of Soweto. “Whoever took the decision to make this a championship golf course has done so much for the people of Soweto, for the nation. I’ve got a lot of friends from Soweto, so they have to travel a long way to the nicer courses. Most of them can’t afford to play so it’s great to have a championship layout in their back yard. “One of my friends actually lives a two-minute walk away from here and he came through yesterday and he said he can’t wait to play after we finish. Lewthwaite, meanwhile, couldn’t replicate the fireworks from the first round, but she usually saves her best golf for the final round and could be strong contender on the last day. “It was a little boring; no holes-in-one today,” Lewthwaite joked. “I played steady golf and I’m right where I want to be – within one shot of the leader. Hall made a disastrous start with a triple bogey seven at the opening hole, but the Ebotse golfer rallied with a trio of birdies after the turn to stay firmly in contention. “I hit it left on the first and paid the price and I was a bit panicky after that seven, but I just trusted my swing after that and I began to feel comfortable over the ball,” said last year’s SA Women’s Amateur Stroke Play champion. “I held it together for the rest of the front nine and I was feeling great after the birdie run, but unfortunately I let another one slip at 17. The cream really did rise to the top on Tuesday as the two main protagonists on the Investec Property Fund Order of Merit – Nobuhle Dlamini and Lejan Lewthwaite – both carded level par 72 to share the first round lead in the R500 000 Joburg Ladies Open at Soweto Country Club. Dlamini and Lewthwaite hold a one-shot advantage over Sunshine Ladies Tour rookie Casandra Hall and India’s Tvesa Malik, who tied for third on one-over. Fifth on her own on two-over is another rookie campaigner, Brittney-Fay Berger, while former champions Stacy Bregman and Bertine Faber share sixth with reigning South African Women’s Long Drive champion Lenanda van der Watt on three-over 75. Coming off a runner-up finish in the Jabra Ladies Classic last week at Glendower, Dlamini has forged an almost unsurmountable lead on 1 597 point. Second placed amateur Kajal Mistry is skipping the season-finale to compete in the Western Province Amateur Championship. Lewthwaite is nipping at Dlamini’s heels in third, but another strong push in Soweto will see the Swazi national seal the deal and pocket to the R100 000 bonus in the season-long points-race. Lewthwaite, who claimed her maiden Sunshine Ladies Tour title in the SA Women’s Masters at San Lameer last month, set the course on fire during the early stages of the opening round. The ‘perfect fluke’ helped Lewthwaite to go out in four-under 33, but coming home she dropped shots at the fourth and seventh before a disastrous double on her final hole (the ninth) saw her lead evaporate. Despite her poor finish, Lewthwaite remained positive about her opening salvo in Soweto. “It’s a pity I couldn’t finish better, but it’s the best position I’ve been in after the first round this season so I’m right where I want to be,” Lewthwaite said. “I hit a perfect tee shot down the middle of the fairway, and actually hit a great second shot with the ball probably pitching pin-high with a gap wedge with 92 metres to the pin. I might have pitched it around 88 metres and the ball just rocketed over the green. Dlamini, meanwhile, produced a quieter scorecard with just two bogeys offset by two birdies. That was despite overpowering a number of holes as she cut doglegs with the driver and even driving the par four 16th - where she could only manage par. “I hit quite a few drivers, there are some holes where you can take a Tiger-line,” said Dlamini. "You can still find the ball if you miss the fairway, the challenge is just how close you can get it to the hole with your approaches. The second shots are the challenge. “On the 16th hole I hit driver on the green. So I was hitting it really nicely. Malik was more than pleased with her effort in just her third start on the Sunshine Ladies Tour after debuting in the Investec SA Women’s Open in Cape Town and contending in the Jabra Ladies Classic last week. “I thought I played a little bit better than my score suggested. I made a few silly mistakes, but I’m happy with my score,” said Malik. Former SA Women’s Amateur Stroke Play champion Hall was equally pleased with an opening 73. “I made a really good start in my debut in the Canon Sunshine Ladies Tour Open and then I set my expectations too high,” said the Benoni golfer. “The next six events were a steep learning curve, but I felt my confidence return at Glendower last week. “It’s tough course and I’m happy to be within striking distance of the leaders. The greens are new and still very firm, so the biggest challenge here is to get the ball as close as possible to the pins.